More Disk Space is a complete system for getting the most usable space from your hard disk. It consists of an application that can run in the background under MultiFinder and a set of System resources that invisibly enhance your Macintosh’s basic file-handling system. The More Disk Space interface is flexible and easy to use. If you startup your Macintosh with the floppy diskette that comes with this manual, you will be able to install the software and get More Disk Space™ with a single menu command. More Disk Space™ represents the culmination of three man-years of effort in the development of leading edge compression and system enhancement technology. More Disk Space™ uses three basic methods for getting the most space from your hard disk: It compresses applications so they take up less room, it compresses data files, and for System 7 users, it replaces duplicate files with tiny aliases. More Disk Space™ can be configured to use all of these methods or only the ones which you prefer to employ. Compression shrinks files by eliminating redundancies. For example, in the previous paragraph, there are four instances of the four consecutive characters, ‘ ’, ‘t’, ‘h’, ‘e’. A compression algorithm can use a single character or less to represent the four letters in the string of characters, significantly reducing the storage space required for that paragraph.The same concept can be applied to whole files as well as the data within files. Under System 7, alias files take up only a tiny space, but they can be used in exactly the same way as their larger counterparts. By replacing duplicate files with aliases to a single file, More Disk Space™ can significantly reduce the storage required by redundant files. 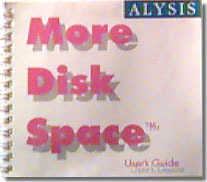 More Disk Space™ is designed to be simple enough to be usable by a child, yet powerful enough to satisfy all of your disk expansion, network acceleration, and compression utility needs.More Disk Space™ can be used in a number of ways: as a one-time hard disk expander, as an automatic hard disk expander which works continuously in the background, as a Finder extension, or as a stand-alone compression utility for users who must manipulate very large data files on a day-to-day basis.Since every Macintosh user approaches his or her machine in a different way, you may find it worthwhile to try each of the interfaces to More Disk Space™ before selecting the interface or interfaces which most suit your needs.